All day long, New Jerseyans have been agonizing: This morning, they watched in horroras an NJ Transit passenger refused to move her bag from a handicapped priority seating area on a standing-room-only, Tuesday night rush-hour train. But then, the video suddenly just … stopped. Well, long-suffering NJ Transit commuters, prepare for catharsis. NJ Advance Media has obtained more video, which shows NJ Transit police finally ejecting the foul-mouthed passenger at the urging of a disgusted NJ Transit conductor and fellow passengers. By now, you probably know how it starts: A young woman on a packed, standing-room-only train from New York to Newark sits comfortably in priority handicapped seating with her Louis Vuitton handbag taking up the seat next to her. Oblivious to the rapidly filling quiet car, she keeps her head down, focused on whatever she’s listening to on her phone. Passengers who entreat her to move it are subjected to verbal abuse and profanity. A conductor finally taps her bag, indicating it should be stored in the luggage rack above, to free up space for many passengers who are now standing. “Don’t put your hand on my stuff!” she yells, her headphones still in, leaving her oblivious to the quiet car. 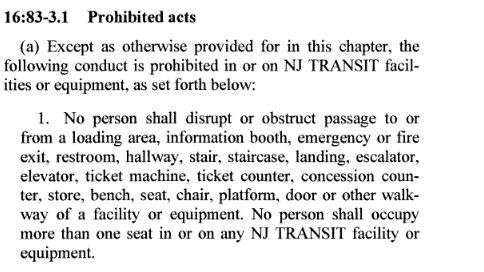 Needless to say, this is New Jersey, and that attitude isn’t going to fly with NJ Transit’s conductors. Dave, the conductor on this train, doesn’t bother quoting from the rule book. He informs her there’s no other seats, and Louis Vuitton will have to buy a ticket if he wants a seat of his own. “Ma’am, put it up there, or I am going to get you off the train right now,” Conductor Dave says. You gotta give it to her: She’s not going to be shamed into giving up a seat for Louis. Dave doesn’t have time for this questionable logic. It’s now been almost 10 minutes of delay, according to Phaedra Frangos, a commuter from Hamilton who filmed the encounter. “Step off, please,” says one of two officers. And with that, our Marie Antoinette went quiet, gathered her bag and phone, and left without another word.